There’s a difference between being data-driven and simply obsessed with numbers. And, it’s an important difference. Data-driven companies understand that the value of data isn’t the data. Rather, value comes from the conclusions, decisions, and actions that result from the data. This is where they focus. The important role that data plays is to ensure that those conclusions, decisions, and actions are based in facts. Having fact-based evidence and putting it on an endless display are two very different things. Data-driven companies also understand that data is part of a broader context. That broader context is made up of the organization’s strategy, its performance, the competitive landscape, and the organization’s history. Sometimes that context may even come from an individual’s experience. When making decisions, data-driven companies take that broader context into account. They synthesize the data and context to create simple, fact-based recommendations and conclusions. While their statements are simple, they are not hollow. They can be backed up with detailed and specific data and analysis. Data-driven organizations focus their discussions on the meaning and implications of their data. At the end of the day, data-driven organizations make faster, better decisions. On the other hand, numbers-obsessed organizations act as if the value of data is in the data itself. This becomes their focus. These organizations put data front and center but don’t seem to talk about anything else. Their leaders spend more time memorizing the current value of every metric, “in case someone asks”, than they do in thinking about what those metrics mean. In a numbers-obsessed organization, leaders insist that people walk them through every piece of the data prior to making a decision. They feel compelled to look at data even when they are already aware of the key points being made in the argument. Their reports and dashboard are full of numbers rather than simple answers. Numbers-obsessed organizations focus their discussions on metrics and numbers. They often don’t get to the decision or when they do, it takes a lot longer. They either get mired in specific details and data points that don’t influence the decision in the first place or they never wind up talking about what all of those numbers mean. Having, displaying, and talking about data does not make you data-driven. Being data-driven requires that you parlay that data into meaningful action. The best data-driven presentations take into account the greatest amount of data but show the least. 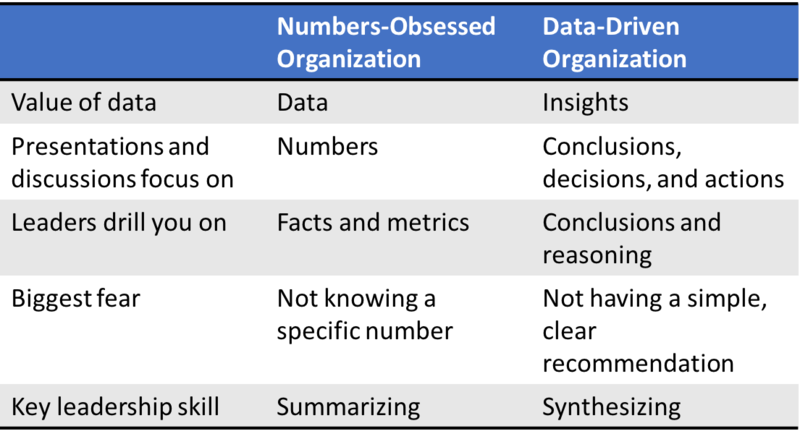 Is your organization truly data-driven or are you simply numbers obsessed? If you are spending more than about 10% of your time talking about numbers, you may be focused in the wrong place. Are you data-data driven or obsessed with numbers? Brad Kolar is a consultant, speaker, and author with Avail Advisors. Avail’s Rethinking Data workshop will help your organization make the shift from being obsessed with numbers to being truly data-driven.